Not Far From the Tree is a Toronto non-profit organization that ensures the fruit in the city is harvested. The residential fruit-picking program allows homeowners to register their trees and have them gleaned by a team of volunteers. The harvest is divided into three ways: one third goes to the homeowner, a third is given to the volunteers and the remaining third is distributed to community food organizations. Soiled and Seeded recently spoke to founder Laura Reinsborough about picking, sharing and eating all the fruit in the city. 1. The United Nations announced 2010 as the International Year of Biodiversity. Urban areas are not typically regarded as centres of biological diversity. Since you began Nor Far From the Tree in 2008, what have you managed to harvest? I recently gave a talk at a conference on Urban Biodiversity and it got me thinking about what the most biodiverse place in our city could be. If you think of it just in terms of quantity of species, my guess is that it's the grocery store. As omnivores who will eat just about anything, our food is a really strong way in which we interact with other species on a daily basis. And yet most of us aren't familiar with the plants that most of our fruits and veggies come from. What grows in Toronto? When I started this project, I had no idea the breadth of fruit growing from Toronto's trees. There are sweet cherries, sour cherries, serviceberries (also known as saskatoon berries), mulberries, apricots, plums, pears, apples, crab apples, elderberries, peaches, and quince. We've also harvested black walnuts, sumac, and gingko nuts. I'm sure there are other native edibles that we haven't yet researched. And if you bring the trees inside in the winter or use a greenhouse, then everything from figs to grapefruits have been known to grow here. 2. While many city residents easily welcome the fruit blossoms of spring, what would you say are the main challenges, or hesitations people may have towards picking fruit in the city. There are many reasons why trees go unpicked: the homeowner is elderly or otherwise unable to harvest from the tree themselves; the trees were planted purely for ornamental value and their fruit isn't of interest to the owner; it may be perceived as more convenient to get fruit from the grocery store; the homeowner may not know the fruit was edible or safe to eat; there aren't enough helping hands to make the effort worthwhile; they are unsure of what to do with the abundance of fruit once it has been picked, etc. When we first started in 2008, the question we would be asked most often was, "But is it safe to eat?" We rarely get asked that question anymore, which I think is a measure of our success. We are changing the perception of our city from one that is dirty and contaminated to one that is rich and fertile - and that show promise of being even more so. 3. What can you tell us about your tree mapping initiative? What will it feature? We are in the very beginning stages of this program, so there isn't much to tell at this point. We are often tipped off to fruit trees that reside on public property. We're interested in creating a map of these public fruit trees, similar to the work of Fallen Fruit in LA. It will be an online map that will likely include a code of etiquette for how to pick fruit from trees on public land. And maybe some recipes, too! 4. 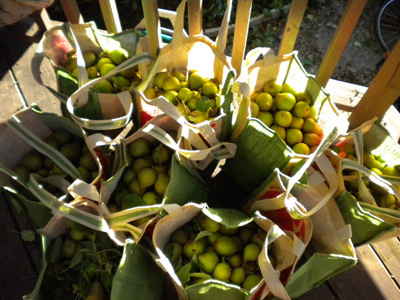 Besides providing a resource, what else does the act of fruit picking provide, or facilitate? I think that one of the biggest impacts we've had is to change public perception about the richness of our city soil. Drawing attention to the fruit trees in our midst can be an eye-opener for many city-dwellers. It certainly was for me. When I picked my first piece of fruit in Toronto (an apple at Spadina Museum), I soon started noticing fruit trees everywhere in my neighbourhood. Seeing beautiful fresh fruit teeming from our city trees gives a hint of the richness that lies in our soil. This is prime agricultural land, much of it in waiting. Fruit trees are an excellent symbol of urban agriculture because they create such a wealth of food for a small footprint on the land. The abundance of fruit that can come from a single tree (e.g., up to 350 lbs of pears) is overwhelming, which is often the reason why homeowners can't keep up with the harvest. Though we offer 1/3 of the harvest to the homeowner, they often decline the full portion because even that is more than enough for one household. This abundance of harvest also lends itself to community engagement. I often hear stories of how a few fruit trees on a street - a cherry tree here, a pear tree a few doors down, an apple tree across the street - have been shared to feed the whole block. These stories come from just a generation or two ago. By picking our city fruit and sharing in the neighbourhood (including food banks and shelters, as we do), we're also building community. 5. In the past three years you have picked from a total of 8 city wards. Combined, these neighborhoods represent Toronto's diverse cultural groups. How have your picking activities been informed by the city's ethnic communities? 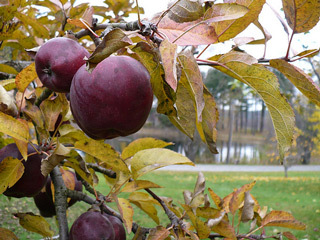 Many communities have strong cultural ties to fruit trees. They are embedded in story, ritual, tradition, and can be reminders of one's homeland. You can read a bit of Toronto's heritage by looking at its fruit trees - some as remnants from old orchards, some as markers of cultural heritage, and others planted purely for ornamental value. Perhaps an even stronger reflection of culture is not the trees themselves but what you do with the fruit once it has been picked. The fruit tree owners, volunteers, chefs, and kitchens where we donate the fruit often share stories of how they have prepared the fruit. Each recipe reflects a cultural history. 6. What are your visions for the future of Not Far From the Tree? Are you planning any upcoming projects? Oh, there are so many ideas! It's all a matter of figuring out which ones will come at which time. For now we're focused on expanding our reach to provide our fruit-picking program across the city and developing the public fruit tree mapping program. Mikael Lavogiez is the Development Director of Soiled and Seeded Natural Heritage Explorations.